Atmospheric events Accidents Odds and ends Snow! I keep a cheap point and shoot camera in my glove compartment, precisely for those time that you see an interesting situation, weather condition, or unusual event. One day I'll get around to scanning in all of my local pictures, and this section will probably get a lot larger. 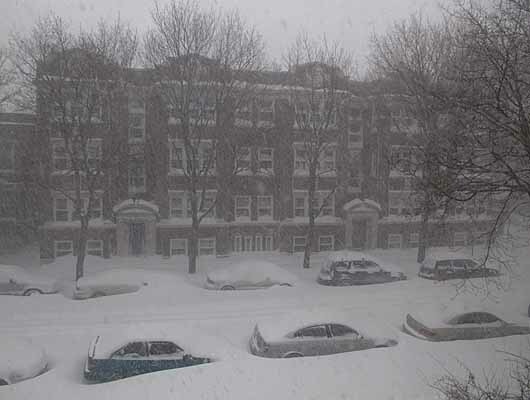 These are some pictures from the Feb 1, 2011 Chicago Snow Storm. The snow started at 3pm, Feb 1, and stopped 36 hours later. Comments are on the picture pages. Imagine waking up one day and finding out a tumor is growing on the side of your building. An internet search showed these were Bald Hornets. They live a year, the queen lays its eggs in the ground in the fall, the hornets all die and the nest is essentially abandoned. When they build a nest on, say a tree, it's round like a pinecone. You then take the nest after the hornets have died, shellac it, and it's supposed to be beautiful. Unfortunately, since they built their nest on the side of the building, it would fall apart when taken off.